Tall, finely pointed with the indescribable air and style of the New York woman, she did not suggest intimate knowledge of the word the ocean hurled to her. In that moss-green room, with her haughty face and clean skin, her severe faultless gown, she rather suggested the type to whom poets a century hence would indite their sonnets—when she and her kind had been set in the frame of the past. And if her dress was conventional, she had let imagination play with her hair. The clear evasive colour of flame, it was brushed down to her neck, parted, crossed, and brought tightly up each side of her head just behind her ears. Meeting above her bang, the curling ends allowed to fly loose, it vaguely resembled Medusa’s wreath. Her eyes were grey, the colour of mid-ocean, calm, beneath a grey sky. Not twenty-four, she had the repose and “air” of one whose cradle had been rocked by Society’s foot; and although at this moment her pride was in the dust, there was more anger than shame in her face. The door opened and her hostess entered. As Mrs. Pendleton turned slowly and looked at her, Miss Decker gave a little cry. “I have been insulted,” said Mrs. Pendleton, deliberately. She felt a savage pleasure in further humiliating herself. “Insulted! You!” Miss Decker’s correct voice and calm brown eyes could not have expressed more surprise and horror if a foreign diplomatist had snapped his fingers in the face of the President’s wife. Even her sleek brown hair almost quivered. “Yes,” Mrs. Pendleton went on in the same measured tones; “four men have told me how much they despise me.” She walked slowly up and down the room. Miss Decker sank upon the divan, incredulity, curiosity, expectation, feminine satisfaction marching across her face in rapid procession. She paced up and down the room with nervous steps, glancing for inspiration from the delicate etchings on the walls to the divan that was like a moss bank, to the carpet that might have been a patch of forest green, and thence to the sparkling ocean. Miss Decker offered no suggestions. She had perfect faith in the genius of her friend. Suddenly Mrs. Pendleton paused and turned to her hostess. The red had come back to her curled mouth. Her eyes were luminous, as when the sun breaks through the grey sky and falls, dazzling, on the waters. The hot September day was ten hours old. The office of the St. Christopher Club was still deserted but for a clerk who looked warm and sleepy. The postman had just left a heap of letters on his desk, and he was sorting them for their various pigeonholes. A young man entered, and the clerk began to turn over the letters more rapidly. The newcomer, tall, thin, with sharp features and shrewd American face, had an extremely nervous manner. As he passed through the vestibule a clerk at a table put a mark opposite the name “Mr. Clarence Trent,” to indicate that he was in the Club. “Mon ami!—I have but this moment received your letter, which seems to have been delayed. [“Of course! Why did I not think of that?”] I say nothing here of the happiness which its contents have given me. Come at once. Trent’s drab and scanty whiskers seemed to curl into hard knots over the nervous facial contortion in which he indulged. Nature being out of material when at work upon him had seemingly constructed his muscles from stout twine. An inch of it joining his nose to the upper lip, the former’s pointed tip was wont to punctuate his conversation and emotions with the direct downward movement of a machine needle puncturing cloth. He crumpled the letter in his bony nervous fingers, and his pale sharp grey eyes opened and shut with sudden rapidity. In the vestibule another name was checked off,—“Mr. Norton Boswell,”—and its owner made eagerly for the desk. His dark intellectual face was flushed, and his sensitive mouth twitched suddenly as the clerk handed him a roll of Mss. The clerk handed him several, and, whisking them from left to right through his impatient hands, he thrust all but one into his pocket and walked rapidly to the morning-room. Seating himself before a table, he looked at the envelope as if not daring to solve its mystery, then hastily tore it apart. “Mon ami! [Boswell, despite his ardour, threw a glance down a certain corridor in his memory and thought with kindling eyes: “Oh! with what divine sweetness did she use to utter those two little words!” Then he fixed his eyes greedily on the page once more.] I have but this moment received your letter, which seems to have been delayed.” [“Ah!” rapturously, the paper dancing before his eyes, “that accounts for it. I knew she was the most tender-hearted creature on earth.”] “I say nothing here of the happiness which its contents have given me. Come at once. Boswell, with quivering nostrils, plunged a pen into the ink-well, and in that quiet room two hearts thumped so loudly that only passion and scratching pens averted mutual and withering contempt. As Boswell left the office a very young man entered it. He possessed that nondescript blond complexion which seems to be the uniform of the New York youth of fashion. The ciphers of the Four Hundred have achieved the well-scrubbed appearance of the Anglo-Saxon more successfully than his accent. Mr. Dedham might have been put through a clothes-wringer. Even his minute and recent moustache looked as if each hair had its particular nurse, and his pink and chubby face defied conscientious dissipation. He sauntered up to the clerk’s desk with an elaborate affectation of indifference, and drawled a demand for his mail. The clerk handed him a dainty note sealed with a crest. He accepted it with an absent air, although a look of genuine boyish delight thrust its way through the fishy inertness of his average expression. “Mon ami,—[“Enchanting phrase! I can hear her say it.”] I have but this moment received your letter, which seems to have been delayed. [“Ah! this perfume! this perfume!”] I say nothing here of the happiness which its contents have given me. Come at once. A rosy tide wandered to the roots of Mr. Dedham’s ashen locks, and he made a wild uncertain dab at his upper lip. Again there was no sound in the morning-room of the St. Christopher Club but the furious dashing of pens, the rending of parchment paper, the sudden scraping of a nervous foot. “Mon ami!—I have but this moment received your letter, which seems to have been delayed. I say nothing here of the happiness which its contents have given me. Come at once. As he turned from the coat-room Boswell entered the office by the opposite door. In a moment they were all shaking each other’s hand off, and good-fellowship was streaming from every eye. Miss Decker paced restlessly up and down the sea-room waiting for the mail. Mrs. Pendleton, more composed but equally nervous, lay in a long chair, with expectation in her eyes and triumph on her lips. Mrs. Pendleton’s nostrils dilated a little, but she did not turn her head even when the manservant entered and held a silver tray before her. Four letters lay thereon. She placed them on her lap but did not speak until the man had left the room. Then she looked at Miss Decker and gave the letters a little sweep with the tips of her fingers. Miss Decker needed no second invitation. She caught the letters from Mrs. Pendleton’s lap and tore one of them open. She read a few lines, then dropped limply on a chair. A pink wave had risen to Mrs. Pendleton’s hair, then receded and broken upon the haughty curve of her mouth. “Oh! how can you be so cool?” and Miss Decker opened another note with trembling fingers. “‘You once chided me for looking at the world through grey spectacles, and bade me always hope for the best until the worst was decided. When you were near to encourage me the sky was often pink, but even the memory of the last six months has faded before the agonised suspense of these seven days. Oh! I shall be an author now, if suffering is the final lesson. But what incoherent stuff I am writing! Loneliness and despair are alike forgotten. I can write no more! To-morrow! To-morrow! “‘An Englishman once said of you, with a drawl which wound the words about my memory—“Y-a-a-s; she flirts on ice, so to speak.” Coldest and most subtle of women, why did you keep me in suspense for seven long days? Do you think I believe that fiction of the delayed letter? You forget that we have met before. But why torment me? Did I not in common decency have to wait six months before I dared put my fate to the test? How I counted those days! I had a calendar and a pencil—in short, I made a fool of myself. Now the chess-board is between us once more: we start on even ground; we will play a keen and close game to the end of our natural lives. I love you; but I know you. I will kiss the rod—until we marry; after that—we shall play chess. I shall see you to-morrow. She looked hard at the ocean. Under its grey sky to-day it was the colour of her eyes, as cold and as unfathomable. The glittering Medusa-like ends of her hair seemed to leap upward and writhe at each other. “‘Dearest! Sweetest! Do you know that I am almost dancing for joy at this moment? Indeed, my feet are going faster than my pen. To think! To think!—you really do love me after all. But I always said you were not a flirt. I knocked a man down once and challenged him to a duel because he said you were. He wouldn’t fight, but I had the satisfaction of letting him know what I thought of him. And now I can prove it to all the world! But I can’t write any more. There are three blots on this now—the pen is jumping and you know I never was much at writing letters. But I can talk, and to-morrow I will tell you all. “‘P.S.—Is it not queer—quite a coincidence—Severance, Trent, and Boswell are going to Newport to-morrow, too. How proud I shall be! But no, I take that back; I only pity them, poor devils, from the bottom of my heart; or I would if it wasn’t filled up with you. Mrs. Pendleton pressed her head against the back of the chair, straining her head upward as if she wanted the salt breeze to rasp her throat. Severance strode impatiently up and down the room overlooking the ocean. Mrs. Pendleton entered and gave him her hand with frank welcome. Her “snakes” seemed vibrant with life and defiance, and her individuality pierced through her white conventional gown like a solitary star in a hueless sky. “How do you do?” she asked, shaking his hand warmly; then she sat down at once as a matter of course. “You will acquit yourself with credit. But I will not quarrel with you to-day.” He rose suddenly and went over to her, but she was already on her feet. She dropped her eyes, then raised them appealingly; but the sea was level. He raised her hand chivalrously to his lips. “I will wait,” he said; “but you will wear my ring?” And he took a circlet from his pocket and slipped it on her finger. “Thank you,” she said simply and touched it with a little caressing motion. He dropped her hand and stepped back. Miss Decker had pushed aside the portière. “Which is it, and where is he?” she whispered eagerly as they crossed the hall. Trent was standing before a bust of Daniel Webster, speculating upon how his own profile would look in bronze. “You would have to shave off your side-whiskers,” murmured a soft voice behind him. He turned with a nervous start, and a suspicion of colour appeared under his grey skin. 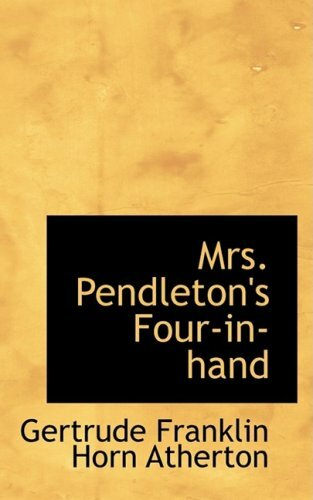 Mrs. Pendleton was standing with her hands resting lightly on the table. She smiled with saucy dignity—an art she had brought to perfection. “O—h—h—h!” and catching her face convulsively in her hand, she sank into a chair. Miss Decker entered with apparent haste, spoke to Trent, then stopped abruptly. “You have heard the parable of a woman’s ‘No’?” She gave both his outstretched hands a little shake, then retreated behind a chair and rested both arms on its back. “Indeed! Well, under the circumstances, perhaps you will not mind removing it and wearing that of another unfortunate,” and he placed one knee on the chair over which she leaned and produced a ring. “Not at all. What a beauty! How did you know that the ruby was my favourite stone?” And she bent her body backward, under pretence of holding the stone up to the light. “What have you done with the others?” asked Jessica, as she closed the door. Dedham was sitting on the edge of one of the reception-room chairs, locking and unlocking his fingers until his hands were as red as those of a son of toil. He was nervous, happy, terrified, annoyed. He buttoned up his coat, braced himself against it, and gave his moustache a frantic twist. She drew herself up and glanced down upon him from her higher chair with a look of sad disapproval. A lamp burned in the sea-room, and the two girls were sitting in their evening gowns before a bright log fire. Miss Decker was in white this time—an elaborate French concoction of embroidered muslin which made her look like an expensive fashion plate. Jessica wore a low-cut black crêpe, above which she rose like carved ivory and brass. The snakes to-night were held in place by diamond hair-pins that glittered like baleful eyes. In her lap sparkled four rings. “And which is his ring?” Jessica made a frenzied dab at the jewels in her lap. She slipped the sapphire on her finger and hid the others under a cushion. Trent, who had been detained a moment by Miss Decker, advanced to her. Jessica gasped and looked at the flames. A crisis had come. Would she be clever enough? Then the situation stimulated her. She held out her hand to Boswell. “You are as cruel as ever,” said Boswell, with a sigh. “Where is my ring?” he whispered. “You may never have been taught when you were a small boy, Mr. Boswell,” interrupted Trent, “that it is rude to whisper in company. Therefore, to save your manners in Mrs. Pendleton’s eyes, I will do you the kindness to prevent further lapse.” And he seated himself on the other side of Jessica and glared defiantly at Boswell. Trent and Boswell being obliged to rise when Miss Decker went forward to meet the newcomers, Severance took the former’s chair, Dedham that of the future statesman. Trent was obliged to lean his elbow on the mantelpiece, for want of a better view of Mrs. Pendleton, and Miss Decker sat on the other side of Dedham. “Good night, Mrs. Pendleton,” said Severance, rising abruptly. “Good evening,” and he bowed to Miss Decker and to the men. Jessica rose suddenly and went with him to the door. As he left the room by one door, Jessica crossed the room and opened another. Severance sauntered up and down the “Forty Steps,” the repose of his bearing belying the agitation within. Dedham, Trent, and Boswell strolled up from various directions, and, although each had expectation in his eye, none looked overjoyed to see the other men. There were four cold nods, a dead pause, and then Teddy gave a little cough. “I always take a walk in the morning;” and Teddy glanced nervously over his shoulder. Boswell and Trent, each with a little missive burning his pocket, turned red, fidgeted, glared at the ocean, and made no remark. Severance darted a glance at each of the three in succession, and then looked at the ground with a contemplative stare. At this moment Mrs. Pendleton appeared. Three of the men advanced to meet her with an awkward attempt at surprise, but she waved them back. The cold languor of her face had given place to an expression of haughty triumph. A gleam of conscious power lay deep in her scornful eyes. The final act in the drama had come, and the dénouement should be worthy of her talents. She looked like a judge who had smiled encouragement to a guilty defendant only to confer the sentence of capital punishment at last. She took from her handkerchief a beautiful little casket of blue onyx, upon which reposed the Pendleton crest in diamonds, touched a spring, and revealed four rings sparkling about as many velvet cushions. The four men stood speechless; not one dared protest his sincerity and see ridicule in the eyes of his neighbour. Mrs. Pendleton dropped her judicial air, and taking the ruby between her fingers, smiled like a teacher bestowing a prize. “Mr. Boswell,” she said, “I believe this belongs to you;” and she handed the ring to the stupefied author. He put it in his pocket with never a word. She dropped it in his nerveless palm with a gracious bend of the head, and turned to Teddy. Teddy looked as if about to burst into tears, gave her one beseeching glance, then took his ring and strode feebly over the cliffs. Trent and Boswell hesitated a moment, then hurried after. Jessica held the casket to Severance, with a little outward sweep of her wrist. He took it and, folding his arms, looked at her steadily. A tide of angry colour rose to her hair, then she turned her back upon him and looking out over the water tapped her foot on the rocks. “You are.” He glanced about. No one was in sight. He put his arm about her shoulders, forcing her own to her sides, then bent back her head and kissed her on the mouth. GERTRUDE ATHERTON was born in San Francisco and received her early education in California and Kentucky, but her best training was in her grandfather’s library, a collection, it is said, of English masterpieces only, containing no American fiction whatever. Yet Mrs. Atherton is as thorough an American as a niece, in the third generation, of Benjamin Franklin should be.